Completed in late 2015, SkyVille @ Dawson is the latest unveiling from WOHA. 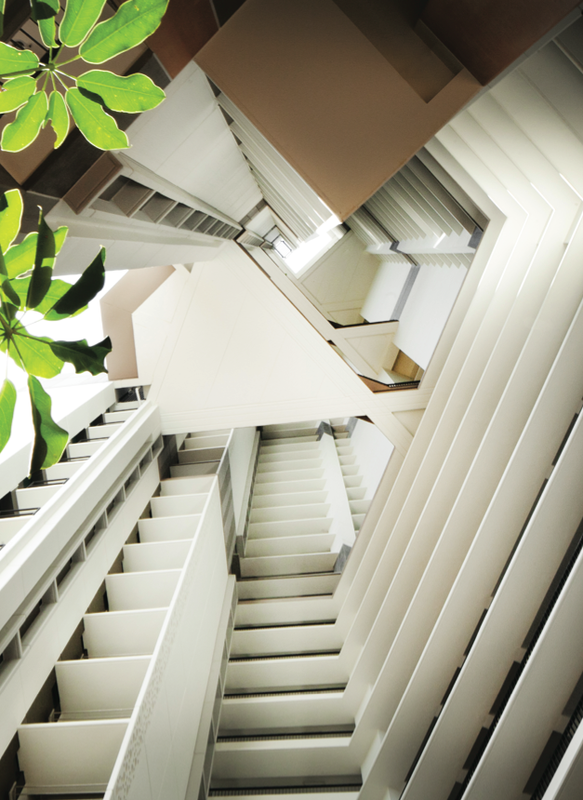 Conceived as an exploration in affordable housing, it is the first public housing project in Singapore to offer internal layout options, but its commitment to liveability and sustainability goes a lot further. SkyVille @ Dawson was commissioned by Singapore’s Housing and Development Board as an exploration of the future in affordable public housing*. Its residential towers rise 47 storeys from the landscaped parks below, housing 960 homes in the sky. Three main themes form the basis of WOHA’s design approach: community, variety and sustainability. Community: Each home is designed as an integral part of a sky village of 80 homes. 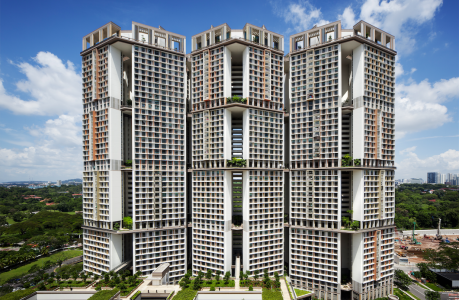 Within the three interconnected towers, there are 12 vertically stacked sky villages, each sharing a community terrace and garden, with double-volume indoor/outdoor spaces, open to natural light and ventilation. Other community areas include the community living rooms at ground level on the main entry route, where seating areas overlook the park. The landscaped park outside retains historic rain trees and provides two community pavilions (for weddings and funerals), play and fitness areas, courts and lawns. The rooftop park houses a 400-metre jogging track and rooftop pavilions. Opposite the towers, beside a public linear park, the urban plaza brings a supermarket, coffee shop and retail spaces within comfortable walking distance. Variety: The façade gives variety by offering three options per unit type. Flexible layouts were developed based on column- free, beam-free apartment spaces, reducing waste and allowing for diverse family sizes, various lifestyles (e.g. home office/ loft-living) and future flexibility. Sustainability: An armoury of passive design strategies and modular precast building components have been used to maximise comfort and climate control, while avoiding energy-intensive technologies. Each unit faces north-south, with openings on all sides, bringing in light and air without the need for air-conditioning. All walls have vertical and horizontal sunbreakers, while all windows are designed with overhangs and custom mid-height top-hung panels that direct breezes to seating level, enabling them to remain open during the monsoon season. Even the common areas, lift lobbies and access walkways are naturally lit and ventilated, with each block serviced by dual refuse chutes for separating organic and recyclable waste. Soft landscaping covers half of all roof areas. The rooftop park pavilions not only provide shelter, but also support a photovoltaic array that powers the common area lighting. As part of the project’s civic contribution, the two major landscaped spaces surrounding the towers and the urban plaza are open to the wider community. Beside the urban plaza, a 150-metre long bioswale treats all stormwater before discharge. 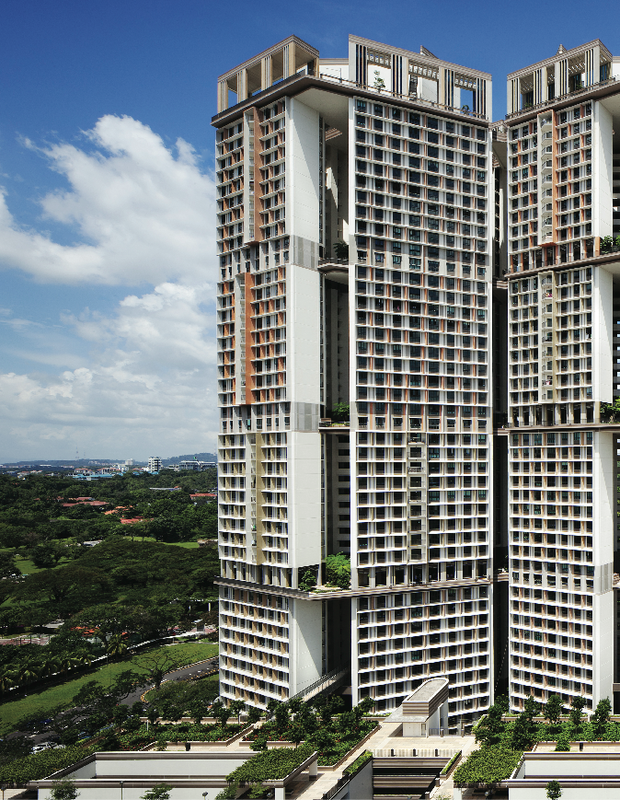 With over 1.5 hectares of publically accessible garden space, SkyVille achieves a 100 percent green plot ratio and received the BCA Platinum Green Mark – Singapore’s highest sustainable rating. What are three key innovations here? Richard Hassell: The combination of guiding principles that underpin the project each brought innovation. Community: High-rise has typically been an antisocial form. Despite high populations, opportunities for interaction are few and privacy and security is at the highest level. For social housing, we felt this was totally wrong, so we investigated how to create communities through making fully public social spaces that are conducive to nurturing community bonds. These were made throughout the building and were consciously diverse in scales, character and facilities. Diversity: To avoid the tyranny of standardisation in a large project, we looked at balancing repetition with variety. 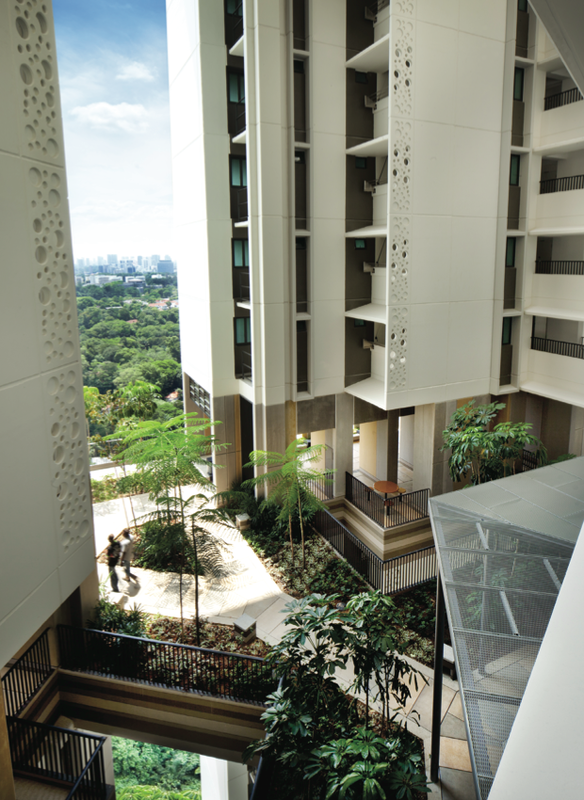 SkyVille is the first public housing project in Singapore to offer plan options, giving people more flexibility in determining internal layouts. This variety was also expressed on the exterior (balconies, sunshading devices, panel variation and colours) to give each apartment, and each sky village grouping, a recognisable difference within the overall cost-effective prefabrication system and the Housing Board standards. Sustainability: A combination of passive, active and behavioural measures were used. By behavioural measures, we mean that apartment interiors were flexible at the time of purchase, with three variations of each plan type offering either fewer or larger rooms. The apartments are column and beam-free, making it easy for owners to later replan or adapt interiors to meet changes in lifestyles or life stages. The combination of the key active and passive measures mean that from a residents’ perspective no spaces rely on artificial light, mechanical ventilation or air-conditioning and common area lighting is solar powered. How is the building designed to influence social interactions among residents? High density can deliver high amenity when social and community space is increased in proportion to private space. Social spaces exist at many levels in the buildings and of different scales. At ground and rooftop levels there are landscaped parks, communal pavilions, exercise areas and childrens’ play areas for the public to enjoy. Within the towers, residents have access to a terrace to each sky village. Residential apartments are organised around a courtyard that is landscaped and visually connected with the common corridors and lobbies of the 11-storey villages. This works as a semi-outdoor communal terrace, where residents can exercise, walk their dog, hold small parties or just step outside their apartments for a breather, or have a chat with neighbours. How does SkyVille add to Singapore’s skyline and street life? Tall buildings should always add to both the skyline and the streetlife. They have a massive impact on neighbourhoods and city skylines, so they need to take that seriously and be a good citizen. We call this civic generosity. We believe that buildings – if personified – should be kind, polite and generous. SkyVille adds to the vibrancy of the area. As well as providing a commercial plaza with food court, supermarket and small retail that all the neighbourhood shares, it houses a neighbourhood childcare centre and the huge landscaped public park. Because SkyVille is located along a well-used linear park that leads directly into the city, the new amenities are highly visible, so they’re well used by many people from outside the immediate neighbourhood. 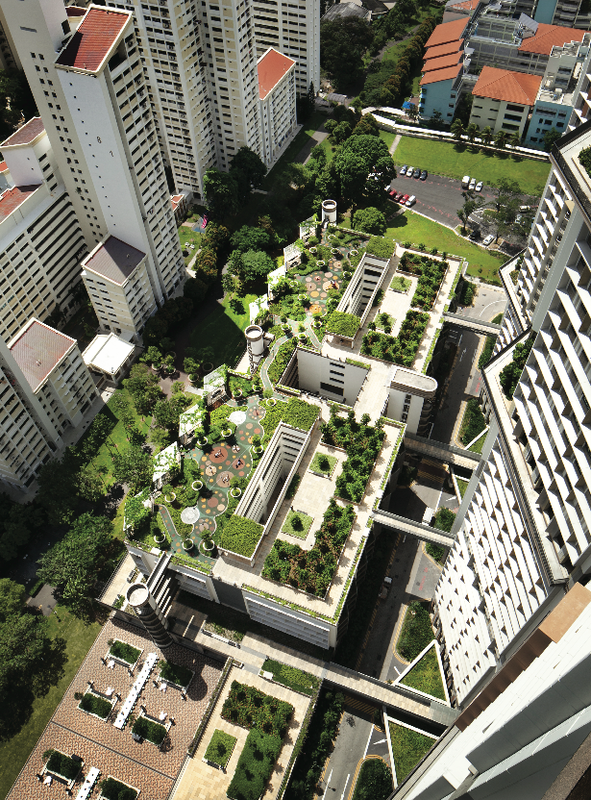 The various roof gardens, sky village terraces and sky park are also open to the public. The entire megastructure is designed like a three-dimensional village layout, with truly public spaces overlooked by private dwellings. In terms of the skyline addition, the sky park is distinctive with its rooftop pavilions scaled to meet the city, at 12 metres high. Combined with the large trees, these are not only attractive, they signify that there is a public space – and life – on top of the building.